Piancone F, Saresella M, Marventano I, La Rosa F, Zoppis M, Agostini S, Longhi R, Caputo D, Mendozzi L, Rovaris M, Clerici M.B Lymphocytes in Multiple Sclerosis: Bregs and BTLA/CD272 Expressing-CD19+ Lymphocytes Modulate Disease Severity. Sci Rep. 2016 Jul 14;6:29699. doi: 10.1038/srep29699. 3) CD19+/IL-13+, CD19+/IL-10+, and CD19+/IL-10+/TGFβ+ (Bregs) B lymphocytes are reduced overall in MS patients compared to HC. B cells expressing BTLA, a receptor whose binding to HVEM inhibits TcR-initiated cytokine production, as well as CD19+/BTLA+/IL-10+ cells were also significantly overall reduced in MS patients compared to HC. Analyses performed in RRMS showed that fingolimod-induced disease remission is associated with a significant increase in Bregs, CD19+/BTLA+, and CD19+/BTLA+/IL-10+ B lymphocytes. B lymphocytes participate to the pathogenesis of MS via the secretion of functionally-diverse cytokines that might play a role in determining disease phenotypes. 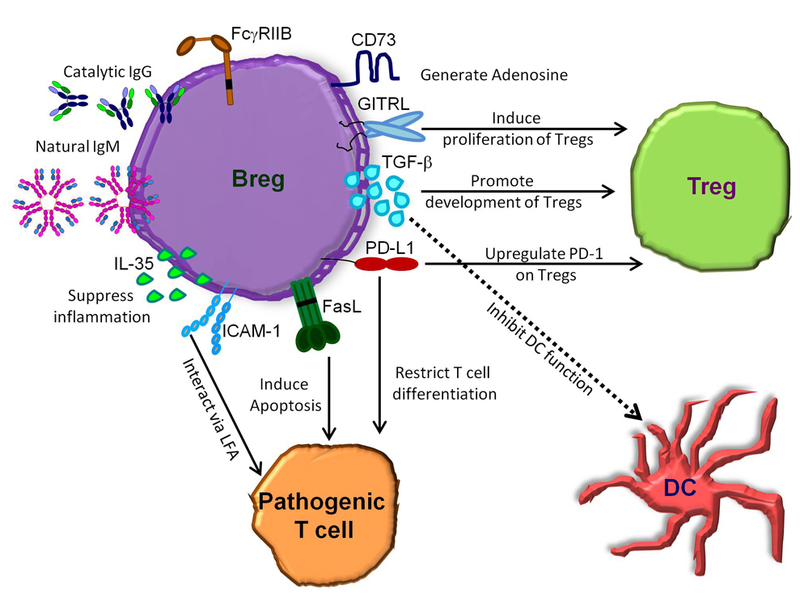 The impairment of Bregs and CD19+/BTLA+ cells, in particular, could play an important pathogenic role in MS.
Just as we know of effector and regulatory T cells there are effector and regulatory B cells. As we are depleting B cells it is important to realise that regulatory cells may get depleted. Animal studies indicate that CD20 B cell depletion can inhibt enhanced or do nothing to EAE, depending on the timing of administration. On balance CD20 B cell depletion and CD19 B cell depletion appears to inhibit relapsing MS but Acaticept that was also supposed to deplete B cells appeared to make MS worse, presumably because it affects B regulatory cells. How then work the Ofatumumab, which if not mistaken is an anti-CD19, would affect only the pathogenic B cells? It would also then why RRMS become SPMS, precisely for that extra change if excretion by the B cells? NewsSpeak & OffLabel: maybe off-label prescribing will be come a global reality?